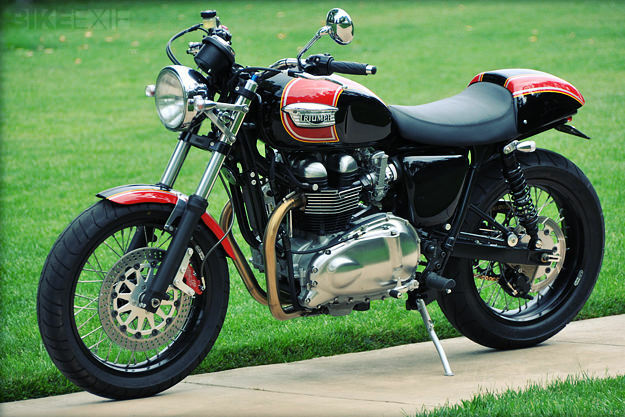 Triumph’s new Bonneville is fast becoming a go-to choice for custom-bike builders who want to start with a reliable current machine, rather than scour junkyards for clanky old donors. The resurrected retrobike has been around long enough now: used examples are affordable, the simple air/oil-cooled motor has its appeal and, of course, there’s that nameplate on the gas tank. 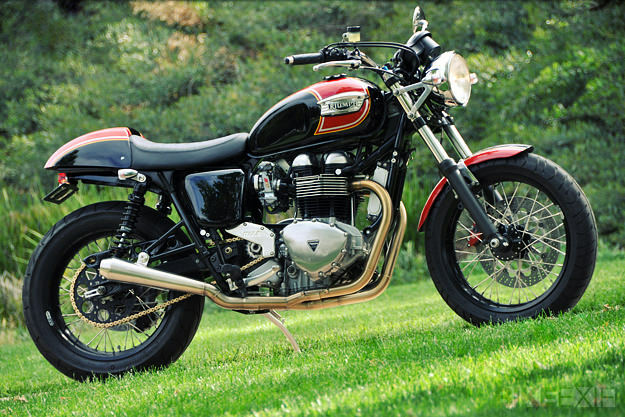 Triumphs start out cool and can easily be made even cooler. 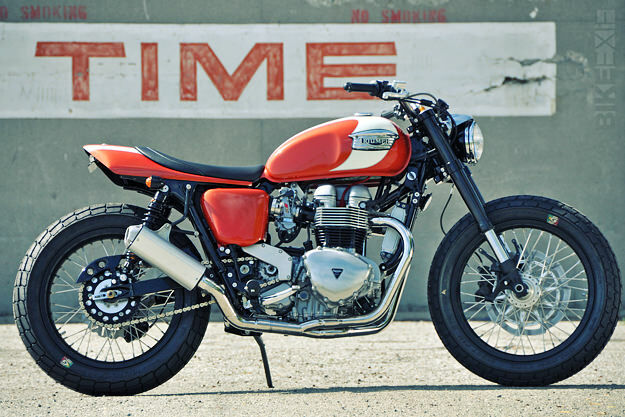 Three cases in point are the latest Triumphs from Mule Motorcycles, Richard Pollock’s little speed shop out of suburban San Diego. Hinckley Bonnevilles are taking up more and more of Pollock’s build time—he currently has six under construction—and he’s just launched a line of aftermarket products for the Brit twin. 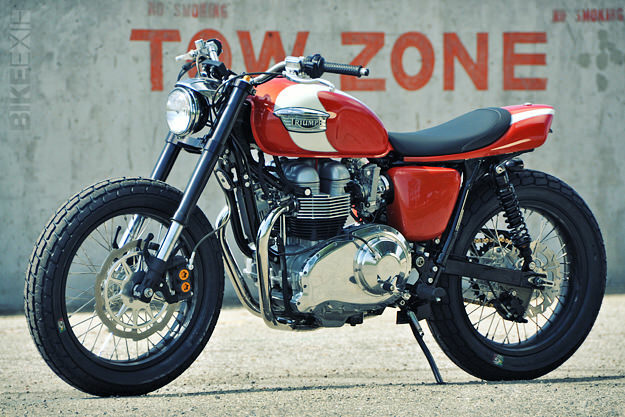 For cost considerations and ease of registration, all three of the Triumphs keep their stock frames rather than the proprietary unit Pollock uses for one-off coachbuilts. There’s still lots of room for individuality, however. The owner of the orange street-tracker (top and above) wanted upside-down forks so it wears a set of late-model Yamaha YZF-R6 tubes in A&A triple-clamps. And while the frame is original, that doesn’t mean it hasn’t been tweaked. Gone are the bolt-on front downtubes, replaced by Mule’s abbreviated versions that also serve as mounting point for the new vertically mounted 4 x 6-inch Earl’s competition oil-cooler. Also missing are the mounts for the passenger pegs/muffler hangers. These were lopped off, the wounds dressed and welded up, then the whole frame was sent out for fresh powdercoat. As the engine was out of the frame anyway, Pollock sent it to nearby Triumph Performance USA for the shop’s standard 904cc big-bore treatment. Together with cams, headwork, a pair of 39mm Keihin FCR flat-slide carbs and a remapped ignition module, plus a set of Mule 2-into-1 pipes, the result is an entertaining 85 bhp at the rear wheel. Back in place, the engine was treated to a polished Streetmaster primary cover, which has a slab-sided comp shop look and features hydraulic clutch actuation. Other items from the Mule catalog on display here include Race Tech shocks built to Pollock’s specs, spoked Sun alloy wheel assemblies and 19-inch Goldentyre CC rubber, Italian flat-track tires that are fully DOT-certified. The fiberglass solo tailsection with sculpted saddle by Sargent is another Mule kit. It requires minor frame surgery, about six inches removed from the rear subframe, and Pollock provides an endcap assembly to be welded in place, which also serves as a perch for the taillight and license-plate bracket. The man who commissioned the red-and-black T100 tracker (above and below) went with the standard Mule front end—with Pollock-designed billet triple-clamps that plug into the stock headset, and allow fitment of 43mm conventional forks from older Yamaha R6s, a favorite of flat-track racers. The customer also wanted a single caliper and a custom rotor carrier, but others will opt for the stock R6 twin-disc setup. Mule’s 1-inch track-bend handlebars in polished stainless-steel allow use of stock hand controls. Wheels in this case are cast Kawasaki hoops from the 1980s, sourced on eBay, sent off to Kosman Specialties for widening, then powdercoated a dark pewter. The end result looks like a pair of expensive and now-unobtainable magnesium Morris racing wheels, at a fraction of the cost. Same Triumph Performance 904 kit in this bike too, Pollock’s recommendation for any customers looking to intensify the stock Bonnie’s, shall we say, stately power output. It also runs Mule’s oil-cooler app. Because there are now no under-engine frame tubes, the mount boss for the stock sidestand is gone. Pollock’s fix is a neat TIG-welded chromoly stand kit that attaches under the left rear downtube. Money was saved by not hacking off the frame’s passenger peg loops, so the bike runs one of Pollock’s off-the-shelf stainless-steel exhaust systems, without the kicked-up dirtbike muffler as on the orange bike. The owner was also quite happy with the T100’s as-delivered chromed primary cover and cable clutch pull. 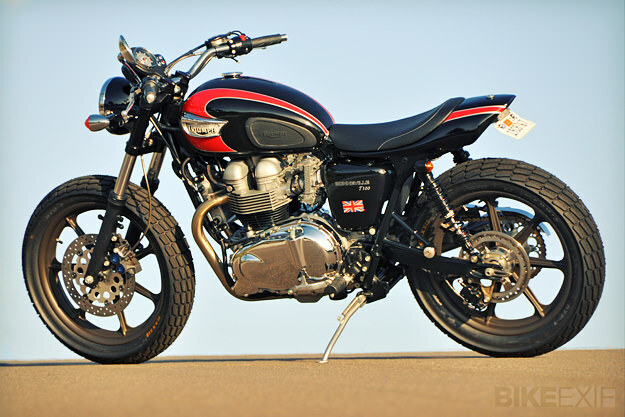 The final of Pollock’s Triumph trio, a Thruxton café-racer (above and below), is a bit of a departure from the street-tracker theme, but in truth the two styles aren’t that far apart. Especially as the client, a Scottish IT guy, wanted the comfort and backroad leverage of low tubular handlebars, and doesn’t care for radically rearset footpegs. The bike runs the same engine mods and chassis upgrades as the previous bike, biggest difference being the wheel/tire package. Here Mule’s spoked hubs connect to 18-inch Sun alloys wrapped with more sporting street rubber. For a little binder bling, a red-anodized Ultra-Lite brake caliper attaches to the R6 fork’s left slider. Pollock kept the Thruxton seat and cowl, though the rear fender was cut back severely and a smaller taillight was fitted. Fans of the late, great Barry Sheene will recognize the paint scheme as an homage to the Heron Suzuki livery that “Baz” rode to two world GP roadracing championships in 1976 and ’77. Bike complete, the client flew in to log 1500 break-in miles around California before shipping the bike back to Scotland. 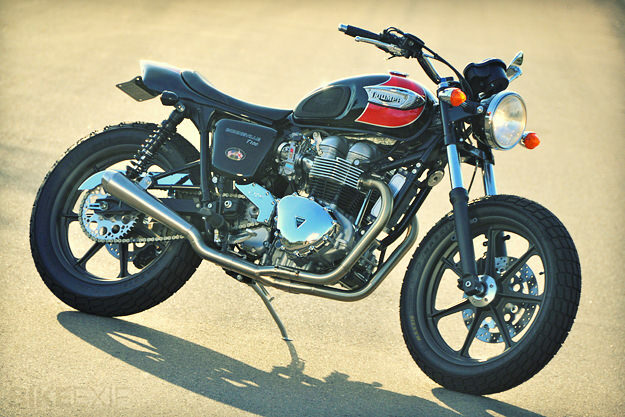 The mileage included a track session at Laguna Seca Raceway, where both owner and builder are happy to report that the Mule Thruxton showed a wheel to none other than Indy 500 winner Danny Sullivan riding his Mert Lawwill Harley street-tracker!